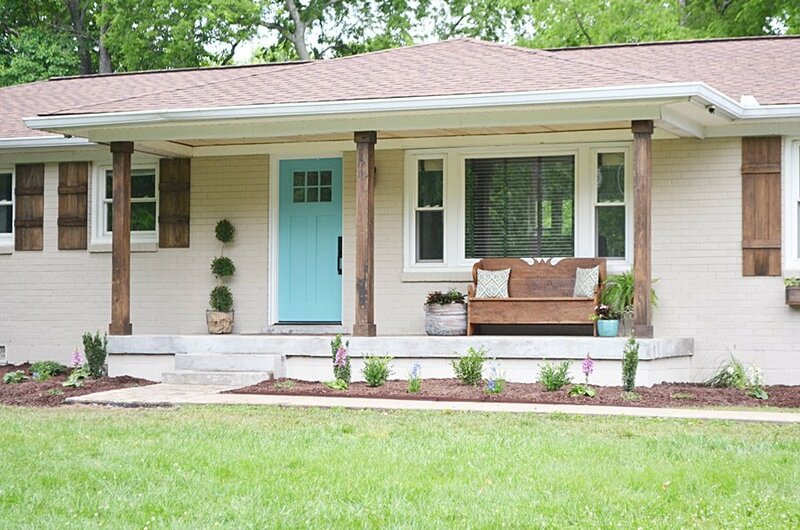 A few weeks ago I told you all that we’re in the process of getting our house painted–thank you crazy hail storm last summer–so I’ve been searching like a mad woman for farmhouse exterior paint color ideas. Now, let me be clear here, we do not live in a traditional farmhouse. Not even close. I sure wish we did, but what we’ve got is a kinda weird looking 1980s fixer upper. The exterior couldn’t be further from a traditional farmhouse, and honestly I’m not really sure what you’d call it. But I’d still love to choose a paint scheme that is similar to that of a farmhouse. White was my first thought–big surprise, huh? Well that ain’t so easy because there about about 832,301 different shades of white. Really, I’m not kidding. So naturally I’ve been souring Pinterest for paint color ideas and I’m excited to share my favorites with you all today. We gotta finalize these colors pronto, so I would really love to hear your opinion! 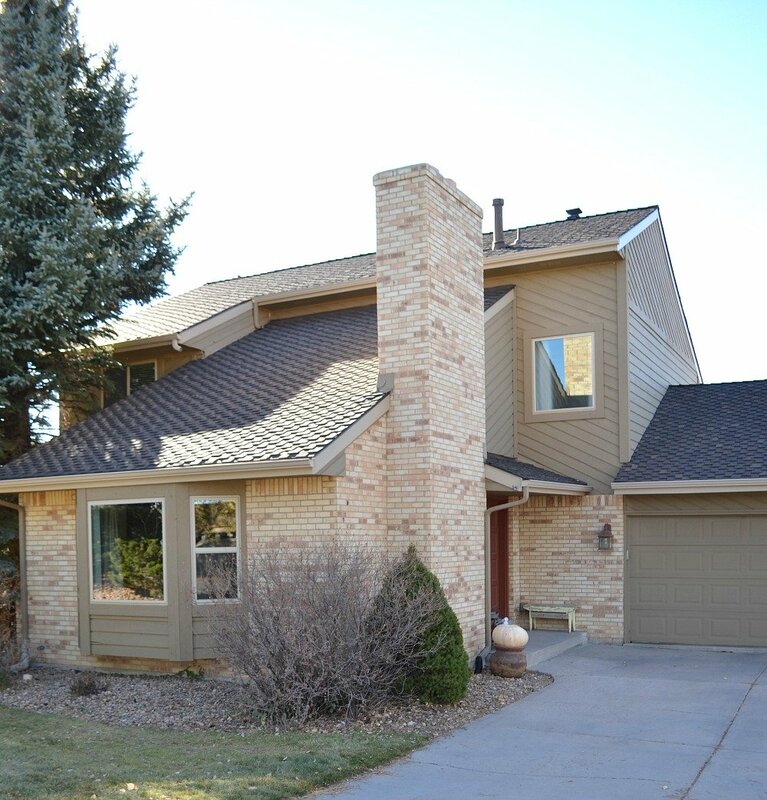 Now, before we get into it, let me show you what the exterior of our home looks like now. Brace yourself. All right guys, those are my favorite picks. Our painter uses Sherwin Williams, so I had to stay in that brand, but I feel like I have some really great options here. Right now I’m leaning towards Oyster White, pictured in the first home, but I also love Alabaster. This is hard. How can white paint be so tricky?! I’m probably over-thinking it, but this is such a huge decision. I mean it’s not like I can just repaint the house if we don’t like it. No pressure! Ok, so which color do you think would look best on our home? I’d really love to get your input. And I need to decide pronto! Painting will start soon, we’re actually hoping the whole thing is done by Thanksgiving. I’ll definitely be updating you with the final result and lots of before/after shots! Thanks so much for stopping by, it really means the world to me! Want to save this pots? Pin for later! We built a farmhouse and went with birch white, which I believe was Sherwin Williams. My shutters and roof are black. I’ve been really happy with it. I personally like the alibaster. I have a sided white home & I really do not enjoy it as white shows every single thing and it’s not warm looking. I think you would have some nice trim/door color options too with the alibaster. That’s a good point Jan. White does show everything, which isn’t a good thing. Thanks for your tip! 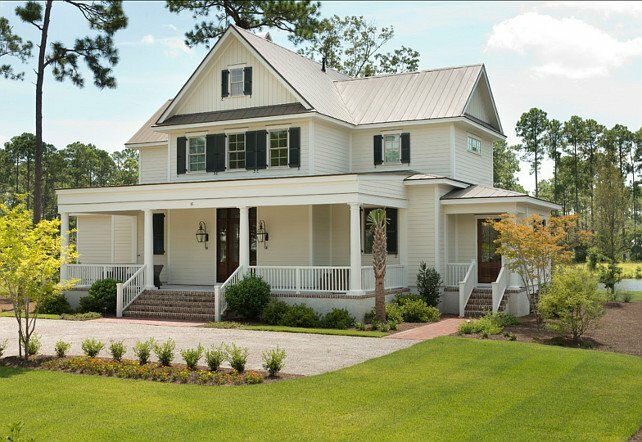 I really like the Oyster white maybe because your house has great angles and the first house has that. 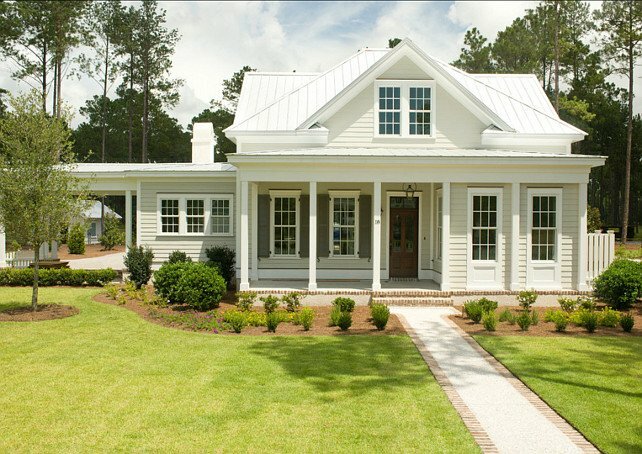 I have never had a white home but love the farmhouse look. Have fun! Thanks Donalee, I think that’s the one we will go with! Not to throw a wrench in this but …… I’d definitely take a closer look at shades of gray. Your house has such a mid century / contemporary look. 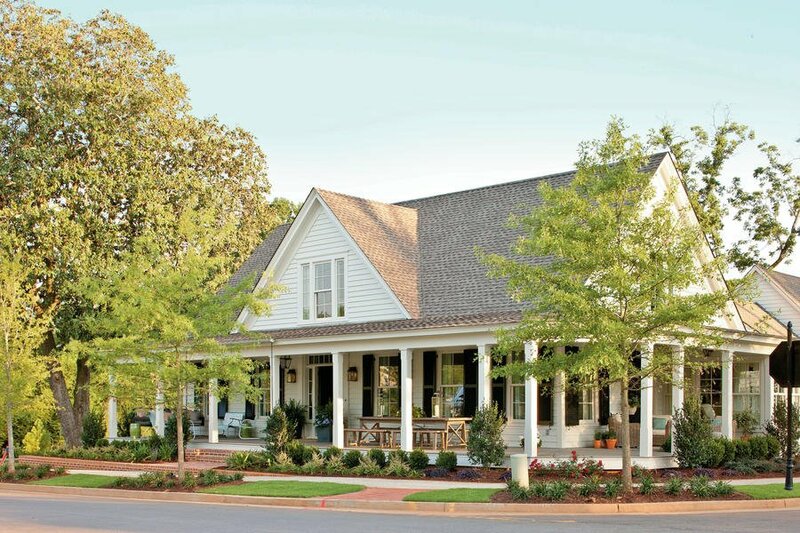 It’s gonna be tough to get a traditional farmhouse look , but some how gray seems to look a little more “intentional ” instead of trying for something. I know you’ve looked and looked at Pinterest. Houzz also has a lot of good options . With that being said , I follow and love your post and unique ideas so whatever you choose in the end will be beautiful . You have a gift for this stuff ! We actually looked into grays, but I just couldn’t find one that I loved. Plus the color on our home now is a mix of gray/brown, so I wanted to freshen it up a bit. Fingers crossed it turns out ok! Thanks for your advice Marilyn! Thanks Erin, that seems to be our winner here! I do love that one too. Thanks for your vote Gayle! I would go with the oyster white as well. I think it will look the best with the brown trim. I think your neighbors will live it too! Sometimes extreme white can get out off quite a glare! I think Oyster White will be perfect too Connie, thanks for your vote! Thanks Tricia, everyone seems to be loving that one too! That seems to be our winner Jennifer! 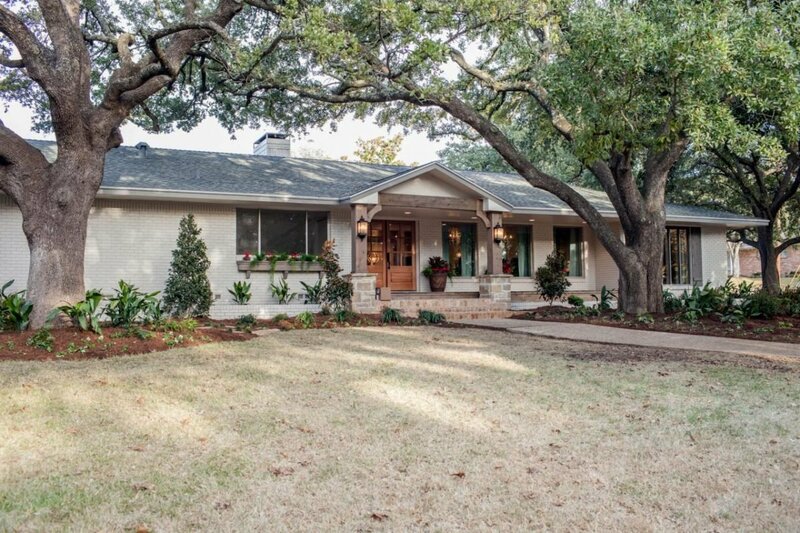 Did you see the episode of Fixer-Upper where they did the “German Schmear”? ???? I love how that turned out and may be something to consider for the brick part on your home? You’re right about your home not being a “traditional” farmhouse but there are ways to give it more of a “rustic” and “vintage” look. 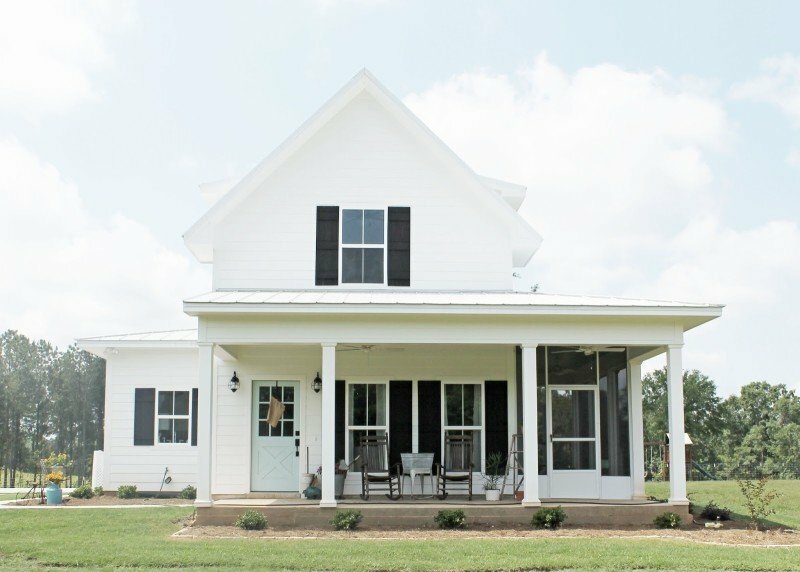 I just love what Joanna comes up with to transform home exteriors into something more modern farmhouse! Good luck with your re-paint! My husband was a painting contractor for over 20 years! I’m sure the transformation will be A-mazing!! I didn’t see that episode Jana, but I need to look it up! 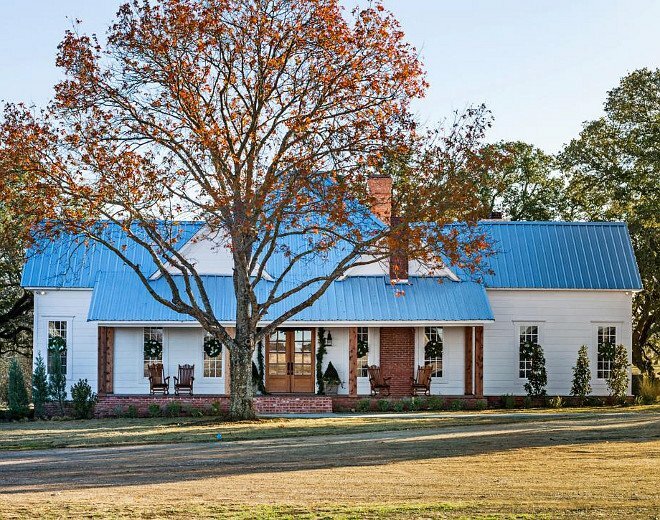 You’re right, Chip and Joanna are amazing at giving homes that farmhouse look even when they’re more contemporary. I wish we could change things up with the exterior like they do, but fresh paint is about the most we can do. Fingers crossed it looks great! I do love that one Mary, my husband did too! Oyster white.!! Definitely.!! It will look great. You have good taste so your choice is perfect.???? Oyster white seems to be our winner, thanks Ann!! I’m with you – I think Oyster White is your best choice, especially with the color that you want to use for trim. Just trust your gut – it will look beautiful! Thanks Karly, that seems to be the winner here! I like the oyster white. 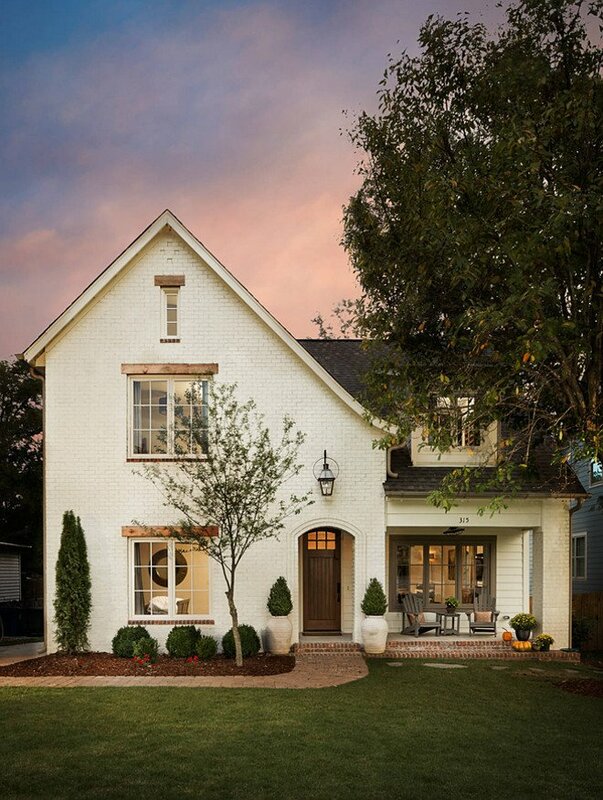 It looks great with the brick and the brown door in the example. I love grays and beige for interiors but not a fan of either for exteriors. I lived with a gray exterior for years. I thought it was beautiful at first but after a couple years it just seemed drab. Thanks for sharing this by the way. From your interior pics I never would have imagined your home was anything but a 100% pure, old-fashioned farmhouse. We’re in the process of purchasing an odd little 1920s bungalow so I’m happy to know that you don’t have to actually have a farmhouse to get that wonderful cozy feel that you have created inside your beautiful home. Oh how I wish it was an old-fashioned farmhouse. Hopefully one day but for now this little 1980s fixer upper will have to do! Thanks for stopping by Kim, and I agree–Oyster White seems to be the favorite! Oyster… I liked it the best before I even read what your fave was. I think it will compliment the angles of your home, and coordinate well with the trim color you are using! I totally agree Julie, thank you! Oh, I agree, the Oyster White is lovely. I am trying to look at the colour only and not the beautiful home that is painted that colour!! I think it would look great on your home too! I like the warmness of the oyster white. That home even has brown trim on the porch window. The color reminds me of the same warm feeling of the interior of your home. Aw thanks Becky, I think it’s going to look great with Oyster White. Can’ wait to share the results! Love the Oyster white, you have great taste! I’m sure it will look beautiful whatever you choose. Thanks Paula, looks like that’s the way we are going! We live in an old saltbox farmhouse and it was originally stark white. We have warmed it up with off white siding in Almond, with red cedar posts and shutters, that are stained a pecan shade. Our roof is brown. I wasn’t so sure at first because I didn’t want it to appear “western like.”We love it and receive many compliments on how it looks. When our home was so white it was hard to keep it clean. So I would recommend an off white like the Oyster or Alabaster. I’m partial to grays too, so Useful Gray would look great too. I also would consider doing a “German smear” on your brick! That would be beautiful! I know it’s a bit more work but the results would be amazing! And so worth it! I’ve been trying out different techniques on brick panels and it’s amazing how they look afterwards! Good luck! Can’t wait to see what you end up doing! Thanks for tips Teresa, I’ve heard that pure white can be hard to keep clean. I think Oyster White is our pick, it seems to be everyone’s favorite too! Can’t wait to share the results. Thanks Doreen, that’s the one we picked!! May I ask where you found out that alabaster is the white on Chip and Joanna’s house? I am painting my house white and can not find that information anywhere. The Oyster White seems to have a yellowish tone to me. LOVE the Chatroom! Would look great with your roof. Check out the Romabio before you go to the hard work of german smear. It is so much easier, I did it myself on our brick. And they can tint it to match your paint also if needed. Hi Sarah – I’m new to following you and love your blog! 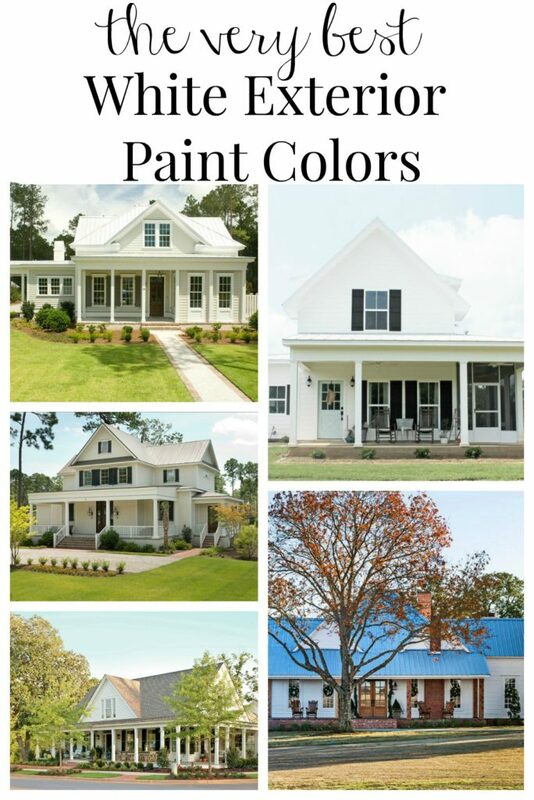 I’m curious if you ever finalized your exterior paint color and showed pictures of the house. I would love if you could send me a link or direct me to the pictures. Hi Tina! We went with Oyster White by Sherwin Williams. I’m painting the exterior of my farmhouse Alabaster and the trim black. My house looks very much like the home with the Sherwin Williams, Natural Choice color. My question is what color do I paint the porch? I was thinking Oyster Grey? Also, what are the variations in color from Alabaster and Natural choice?